UWPD partners with the bicycling community, retailers, city agencies and other university departments to reduce bike theft through education, awareness, and enforcement. Bicycle theft is one of the most common crimes on campus, but through our efforts–and your help, we can make our community a model for bicycle security. Register your bike with UWPD and BikeIndex.org here, use a sturdy u-lock, and always call 9-1-1 if you see suspicious activity. The University of Washington Police Department partners with the bicycling community, retailers, city agencies and other university departments to reduce bike theft through education, awareness, and enforcement. Bicycle theft is one of the most common crimes on campus, but through our efforts–and your help, we can make our community a model for bicycle security. The UW Police Department has a crime prevention awareness campaign, and we continue to promote bicycle registration. Our partnership with Seattle Police Department helps us spread awareness and helps support enforcement through information sharing. UWPD patrol officers focus their time in high bike theft areas and continue to identify and arrest prolific offenders while detectives follow up to recover stolen bicycles and collaborate with the prosecutor in filing cases. Register your bike. Knowing your serial number makes it easier to return your bike to you if it ever gets lost or stolen. Engrave an owner id on your bike. If your serial number has worn off or the bike never had a serial number, use an engraving tool to apply an owner id, such as your driver’s license number (never use your social security number). Engraving tools can be borrowed from the UWPD; call 206-543-0507 to learn more. Use a u-lock. The vast majority of bikes stolen on campus are locked with weak cable locks. U-locks might cost a little more, but it’s worth it. Lock your bike correctly. Secure the lock through at least one wheel and the frame. Locking a quick-release wheel (but not the frame) to a rack is a good way to get your bike stolen. Check into getting access to a bike locker or bike cage. Lockers and cages have limited availability and require a fee. Call 911. If you see suspicious activity around bike racks, give us a call. This is the most frequent way we catch thieves in the act. Calling from a cell phone? If the suspicious activity is occurring on campus, request that the dispatcher transfer you to the UWPD. Make a police report when your bike is stolen. We can’t help if we don’t know about it. Make an anonymous tip. If you know something about a crime but wish to remain anonymous, you can call the UWPD on its tipline at 206.685.TIPS (8477). 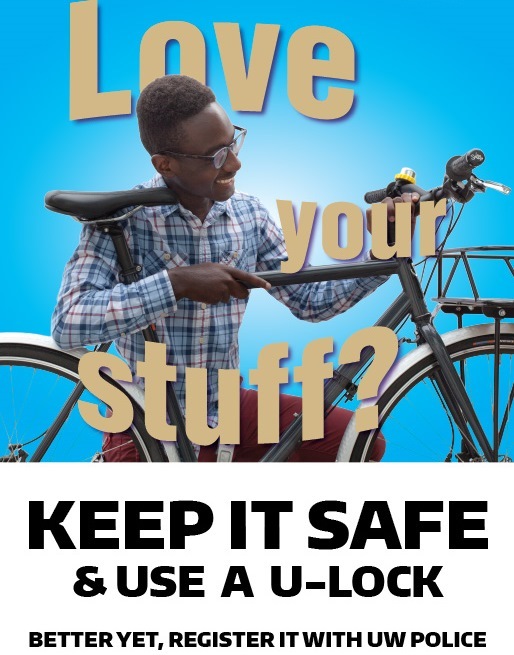 Learn more about bike theft crime prevention and the Love Your Stuff crime prevention campaign.